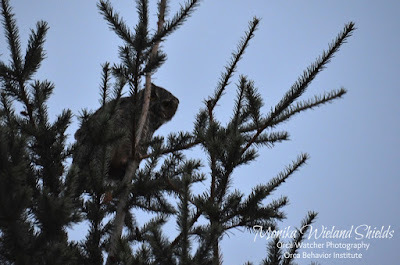 After a season where the Southern Residents were scarcer than ever, I had feeling the season might continue to wind down with few sightings of Js, Ks, and Ls. 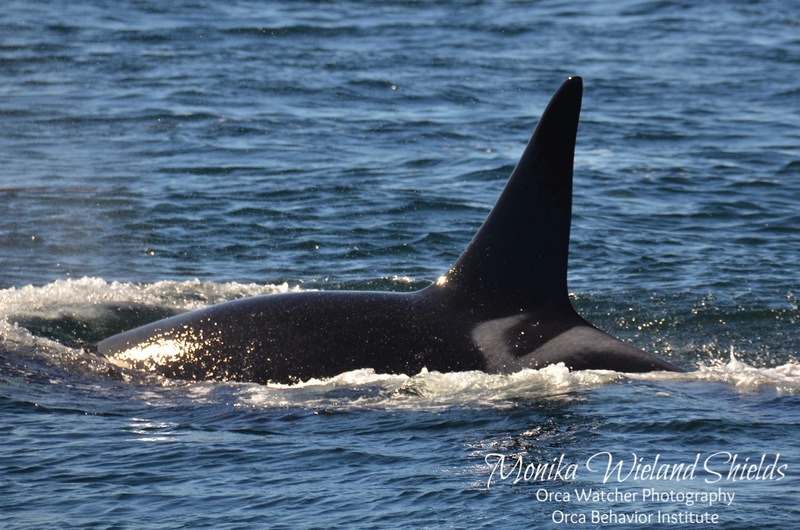 Luckily, September, which has always been my favorite whale month, did not disappoint, and the Southern Residents were around more this month than any other month in 2017. They weren't always nearby, spending some days down in Puget Sound or up at the Fraser River or even further north, but that was okay - just knowing they were in the Salish Sea again for a longer stretch of time made everything feel more "right"! 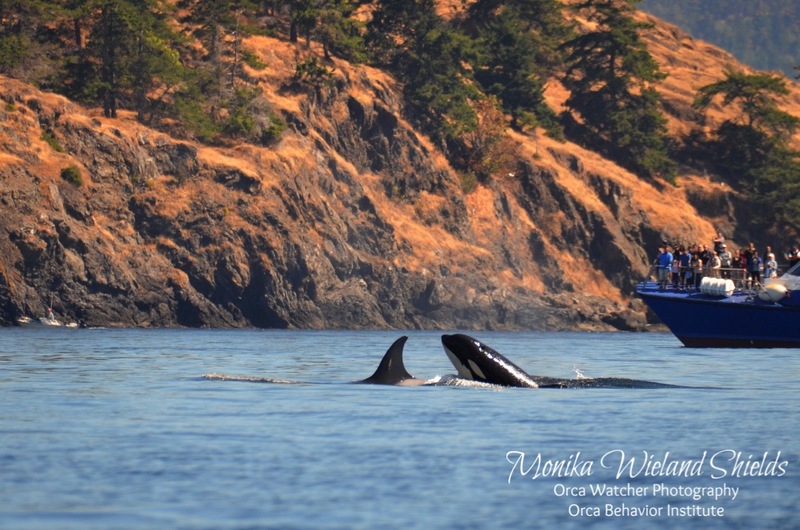 On September 23rd, J-Pod and the Greater L4s (19 L-Pod whales) came down Rosario. The question was whether they would head west out the Strait of Juan de Fuca or up Haro Strait once they rounded the bottom end of the San Juan Islands. Jason and I waited at Cattle Point to see what they would do. 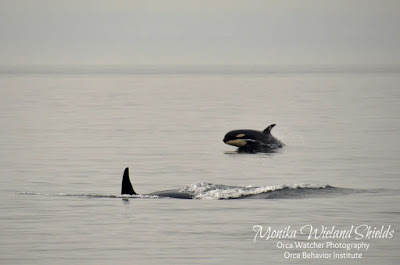 They took their time reaching us, but once they did they sped up, and in the direction favorable for us - up Haro Strait! 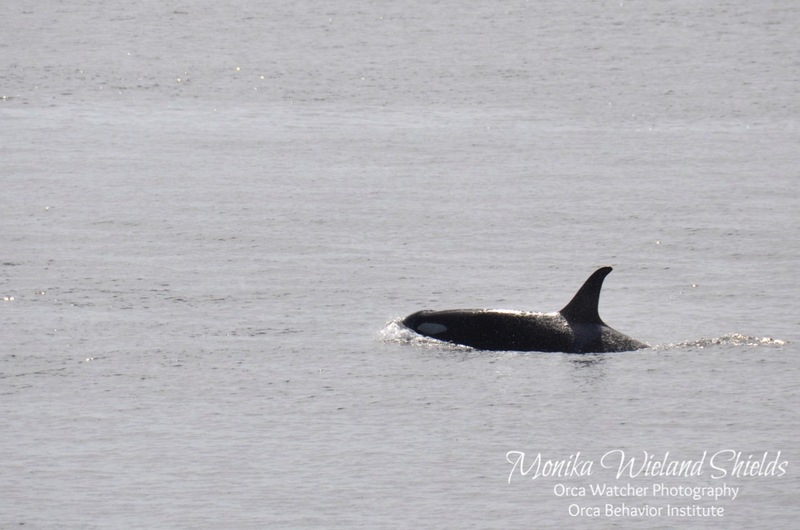 Some whales were way too far offshore to ID, but the last group to pass us was the J16s. Sadly, it was clear their family had gone from six whales to five. 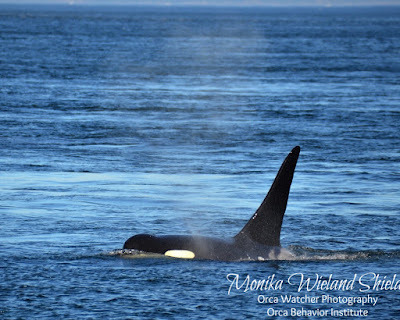 We had learned earlier in the month from the photogrammetry team assessing whale body condition using a drone that J52 was very emaciated and appeared to be in "terminal condition". Indeed, by the 23rd he was no longer with us, bringing the total number of Southern Residents down to 76 - the lowest since the mid-1980s. 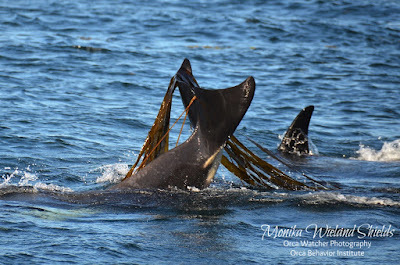 I have no doubt the whales grieve, but they show amazing resilience, and so must me. As the whales continued north, the waters were so glassy calm that we decided to hop in the boat and meet up with them north of Lime Kiln. 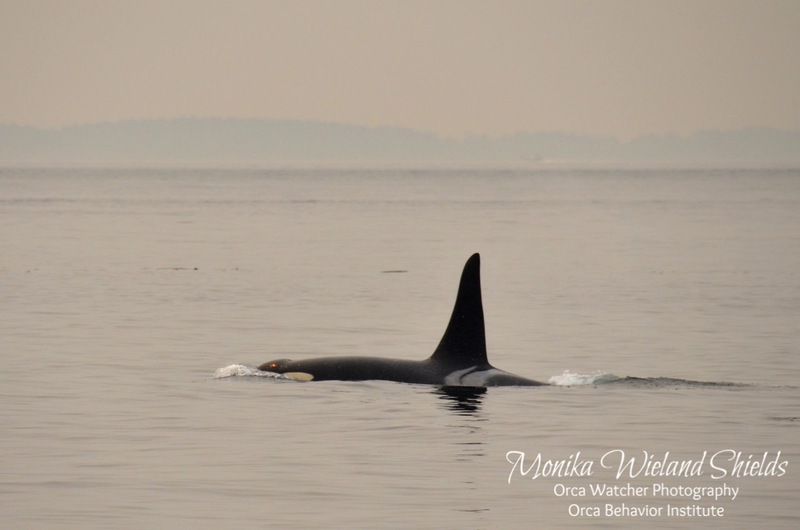 The first whale we encountered was J19 Shachi, who seems to often be in the lead these days. We stopped to watch her forage while other whales were visible to the south. Eventually it looked like the whales decided to head southwest, and before she turned around she surprised us with one big, beautiful breach! Luckily I happened to have the camera ready, and snapped one of my favorite photos of the year. Before leaving we saw some of the J17s, too, including a very active J53 Kiki. 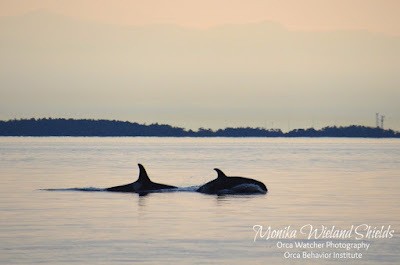 From their trajectory, I was afraid the whales might leave that night, but they snuck back north during the middle of the night and were found the next morning making their way back to the Fraser River. 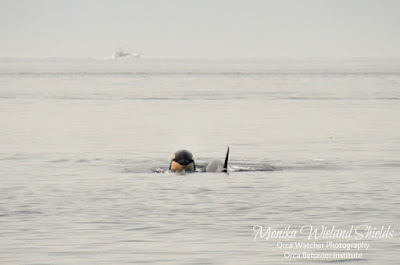 I caught up with them again on the morning of September 27th when they had looped back to Haro Strait again. 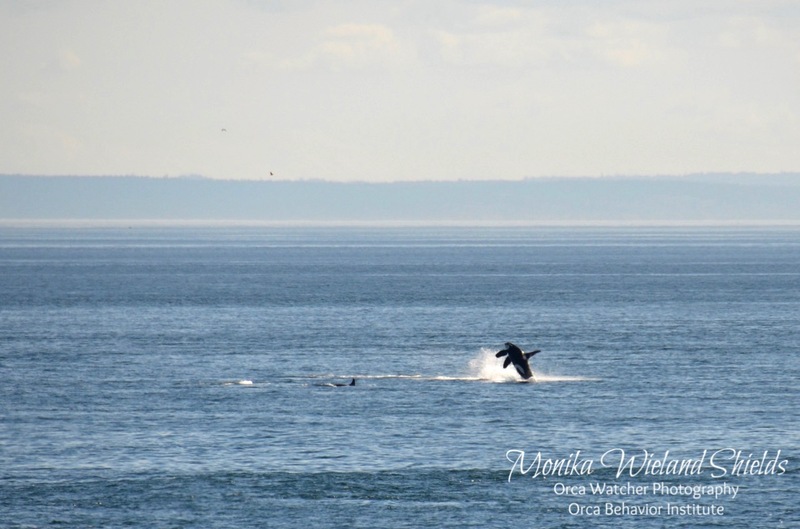 For a couple hours the whales were very spread north to south and east to west, all just milling. 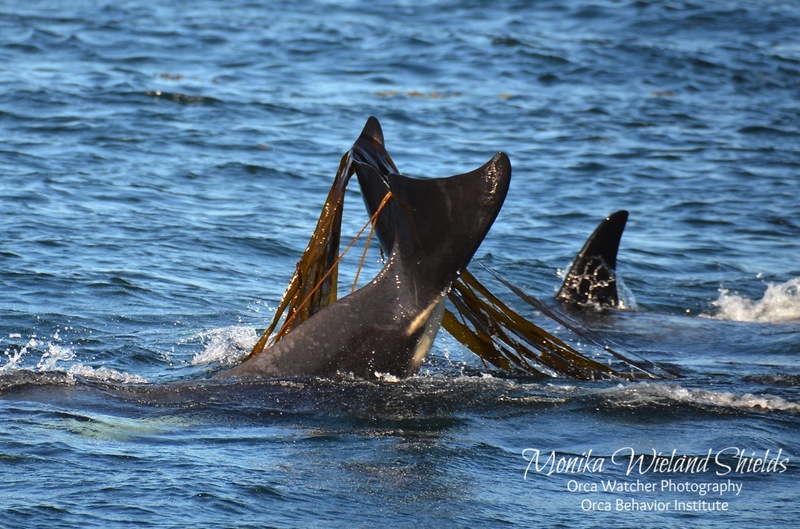 It was great to see so much active foraging behavior, with lunging whales in all directions. 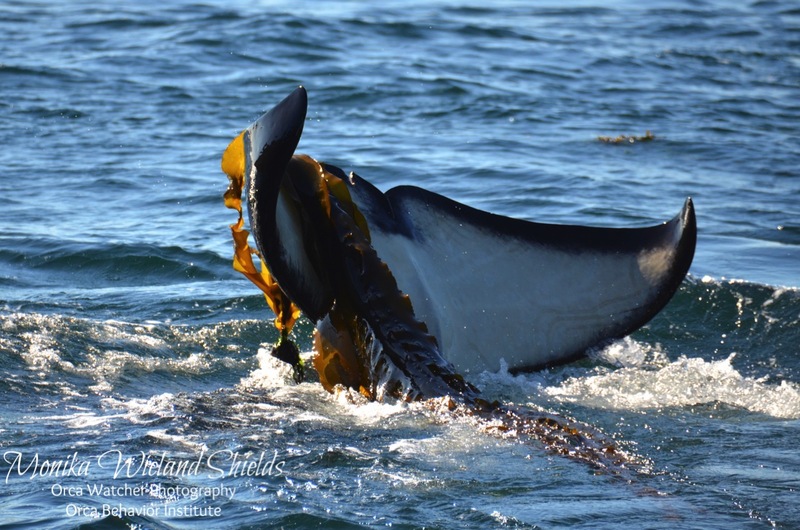 I was having trouble figuring out who was who, and later when I took a closer look at my photos I realized why - the whales were all mixed up! By that I mean they weren't in their matrilineal family groups as they are most of the time, so there was no making assumptions about who was traveling with whom. 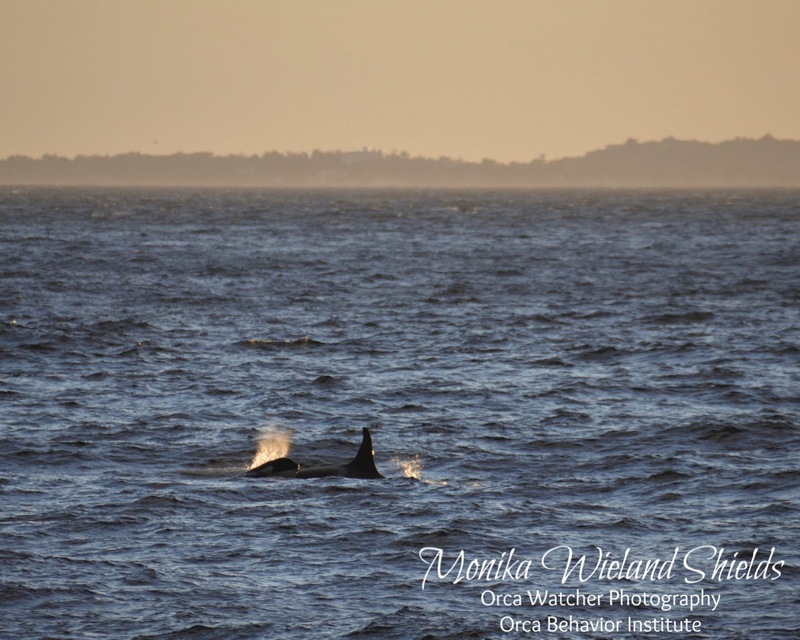 Eventually the whales decided to head south, but very slowly against the strong flood tide. 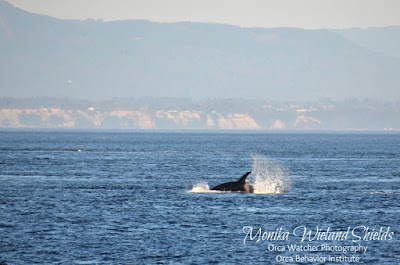 I was debating whether or not to leave (I was playing hooky from work, the whales were mostly very far offshore, and the wind was very cold!) 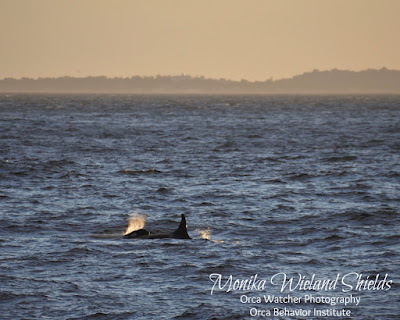 when I spotted some blows just past the point to the north of the Lime Kiln Lighthouse. That decided it! I wasn't going anywhere. It was well worth the wait in the cold for this close pass by another mixed up group of Js and Ls including some of the J19s and J16s, the L72s, and L87. Moments like this are always special, but even more so this year when they were few and far between. 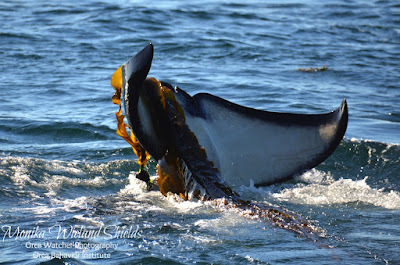 L105 Fluke - getting so big! I love my versatile 18-300mm lens that can capture those close-up shots of kelping whales but that I can also quickly zoom out to capture more of the scene to show you the feel of just how close these whales are. The day after this the Js and Ls split after nearly two weeks together, with Ls heading west and Js heading down for a quick visit to Puget Sound. 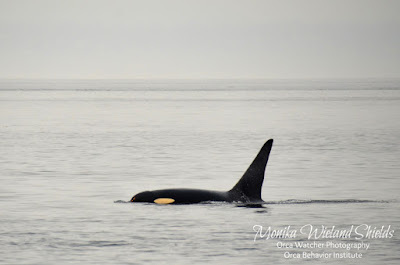 Yesterday, September 29th, I was surprised to hear a late day report that J-Pod was at Salmon Bank off the south end of San Juan Island heading north in rough seas. 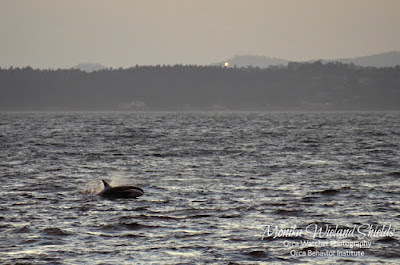 We headed to Lime Kiln in hopes that they would make it that far before sunset. Some of them did, though they were still passing as darkness fell. 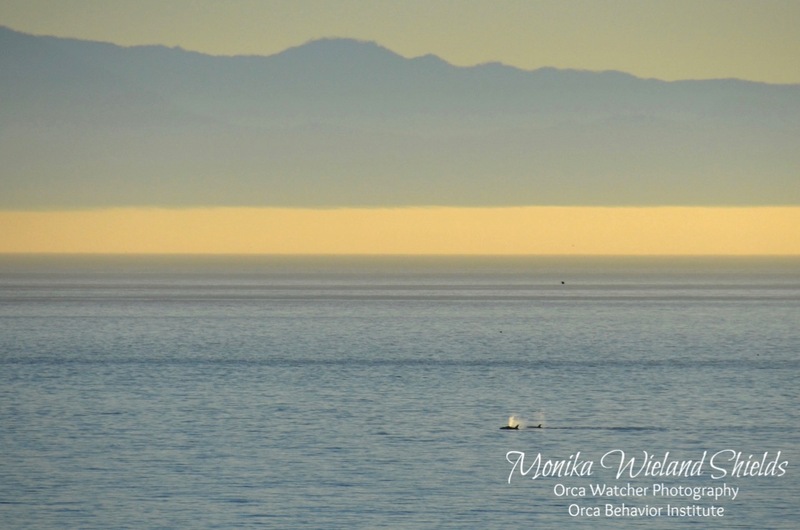 It's always impressive to see the whales in big seas. 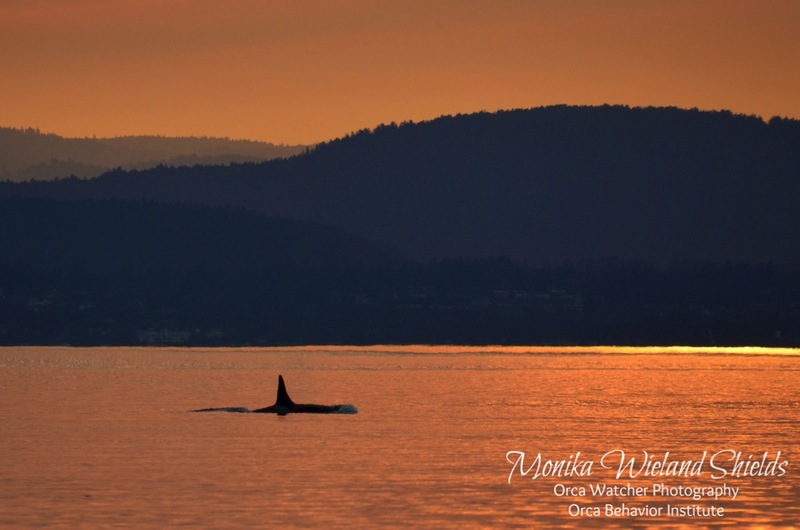 They continue north as night fell, meaning they're spending at least another couple days in the Salish Sea. As October arrives, I can only hope that we're treated to another great month of having the whales around. 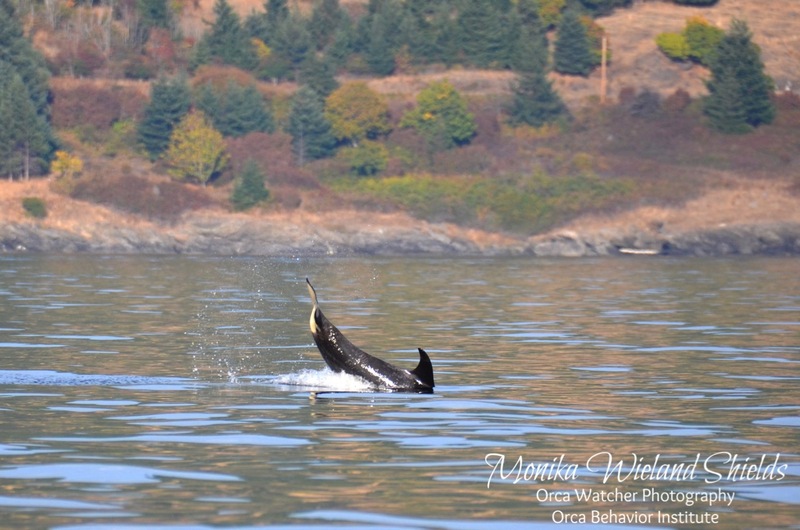 It seems to vary a lot from year to year how much they're here in October, but with the Southern Residents being scarce all summer, we're more than ready for a whale-filled fall! 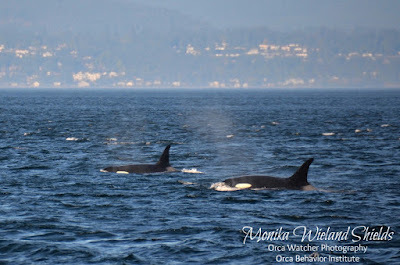 The Southern Residents had last been seen in inland waters on August 4th (and with our trip to northern Vancouver Island, I hadn't seen them since July 24th), when on September 4th the long-awaited news came in of many resident killer whales inbound in the Strait of Juan de Fuca. Over the next few hours we heard that Js, Ks, and Ls were all there, and it turned out to be by far the closest thing we've had to a superpod in 2017. 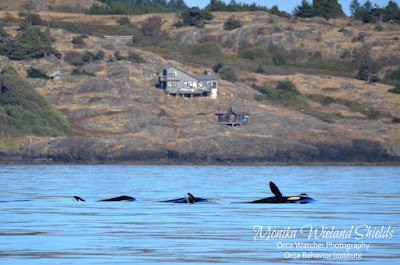 I believe everyone but the L54 sub-group was there, for a total of 72 whales. 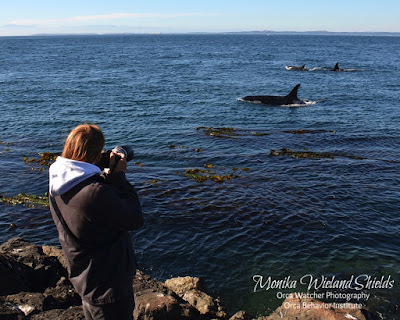 It was definitely noticeable that the days are getting shorter as we waited with many other hopeful whale-watchers for the residents to arrive at Lime Kiln Point State Park. 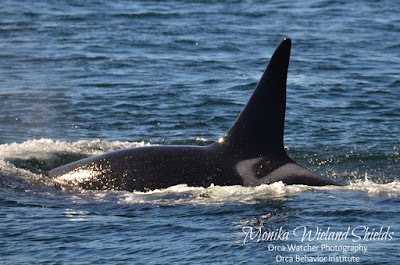 The first large group of whales made up of most of J-Pod and the L12 sub-group headed north on the far side of Haro Strait, while others hit the island to the south of us an initially went south. 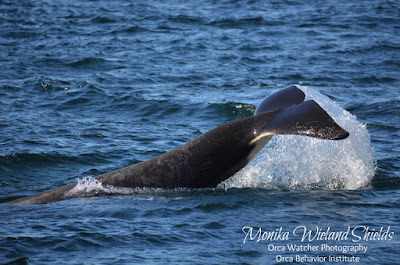 While for a while there weren't many whales close enough to see, the vocals were still amazing. Here's a clip of what we heard. 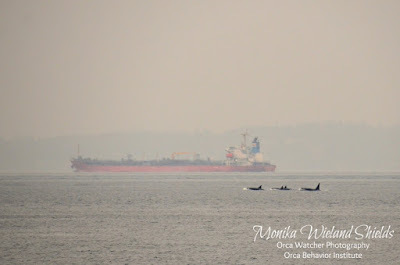 Finally our patience paid off as the southern whales also decided to go north. 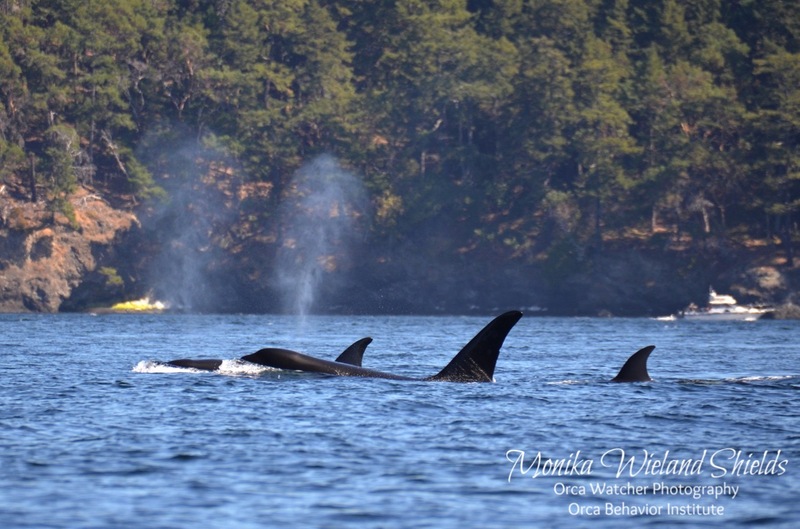 The J19s, K12s, and K13s came by decently close to Lime Kiln, and it was like saying hi to some long-lost friends. 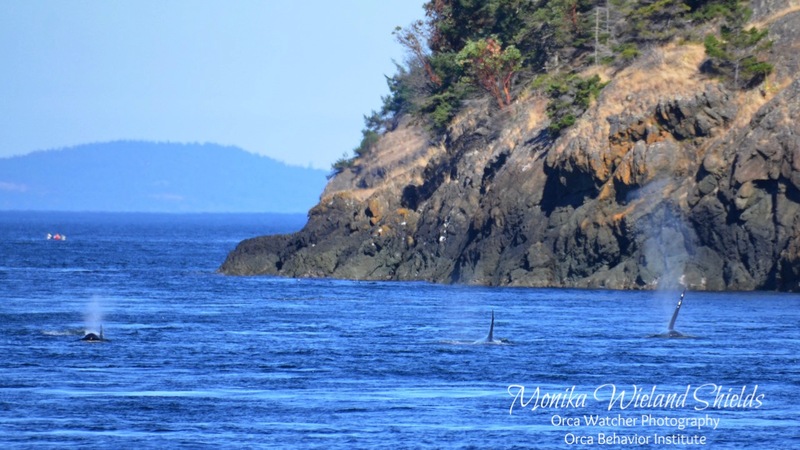 I've very much enjoyed getting to know our regional transient killer whales better this season, but it has not filled the void the absence of the Southern Residents for so much of the year has left. 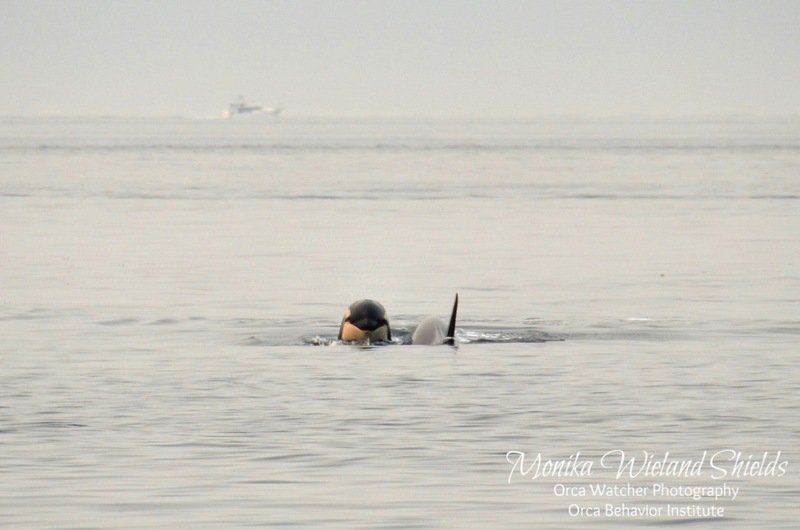 The majority of K-Pod (all but the K14s) had not been seen in inland waters since mid-February. I had seriously been beginning to wonder if for the first time ever I would actually not see them for a season. 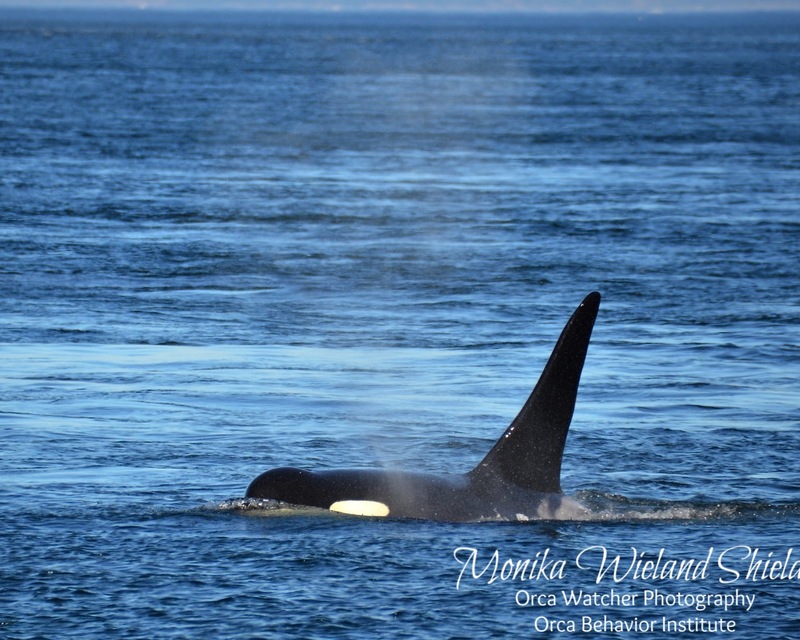 I was so glad to get the chance to see some whales I hadn't seen yet in 2017, like K33 Tika. 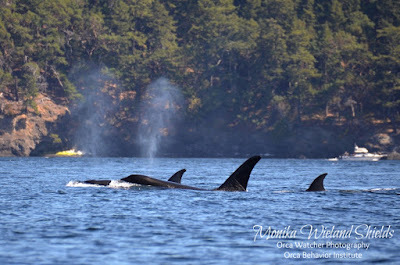 There was another gap between this group before any more whales passed by. 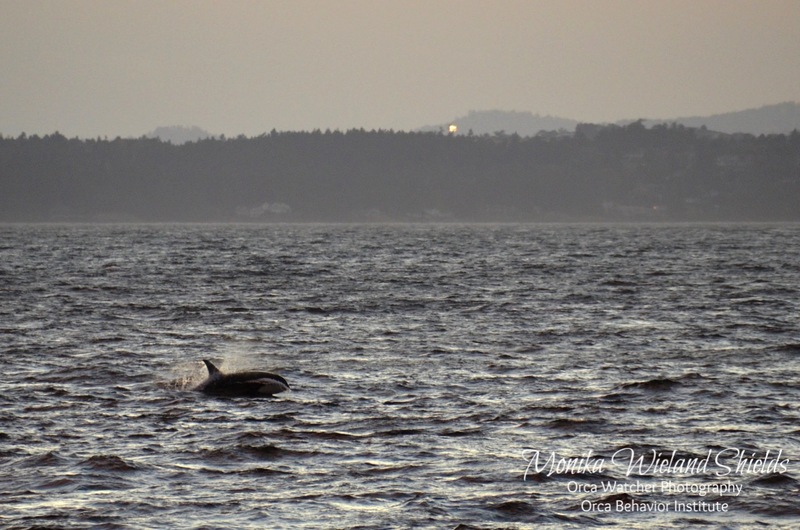 It quickly got too dark to see, but not before we spotted L87 Onyx heading north offshore in the sunset lighting. 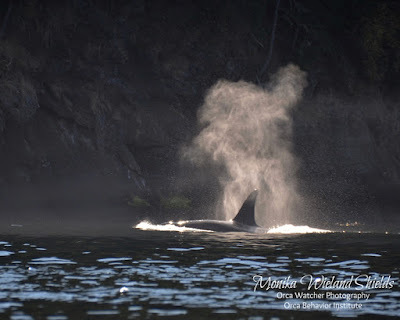 The rest of Ks and Ls did pass by after dark, not seen but heard on the hydrophones as the amazing vocals continued. I was so thankful they were going north up to the Fraser River, meaning that they would be around for at least a couple days rather than straight back westbound in the morning. 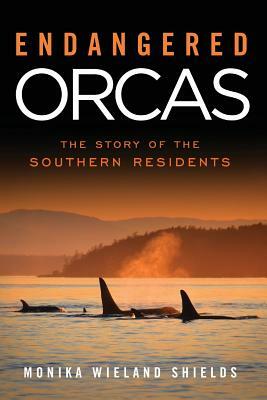 Indeed, they spent the day of September 5th up in the Strait of Georgia, hopefully gorging on salmon. On September 6th, they all made their way back down Haro Strait. Amazingly, while waiting for them at Lime Kiln, not residents but transients were the first orcas we saw! One group of transients was coming south ahead of the residents, and another group was going north up Haro but did a quick 180 to follow the others south. 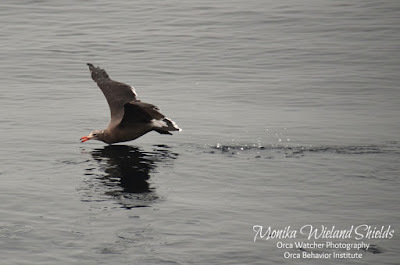 They were all offshore and porpoising or swimming quickly south. Whether or not this was because of the residents is hard to say for sure, but there are so many anecdotal cases of transients ceding ground to residents that it really does look like avoidance. 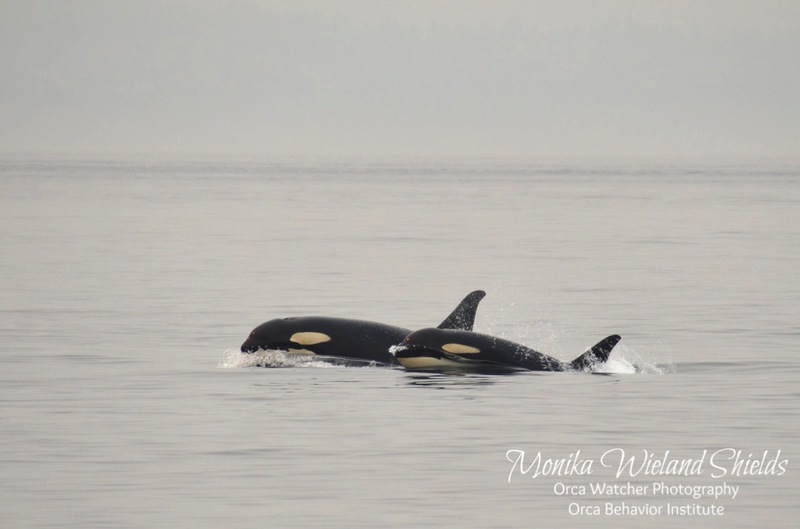 So fascinating, and so many questions arise about what will happen in the future as transient groups keep getting larger and residents are often fractioning into smaller groups locally. In the gap between the transients and residents, I snapped some photos of the foraging Heermann's gulls off Lime Kiln. 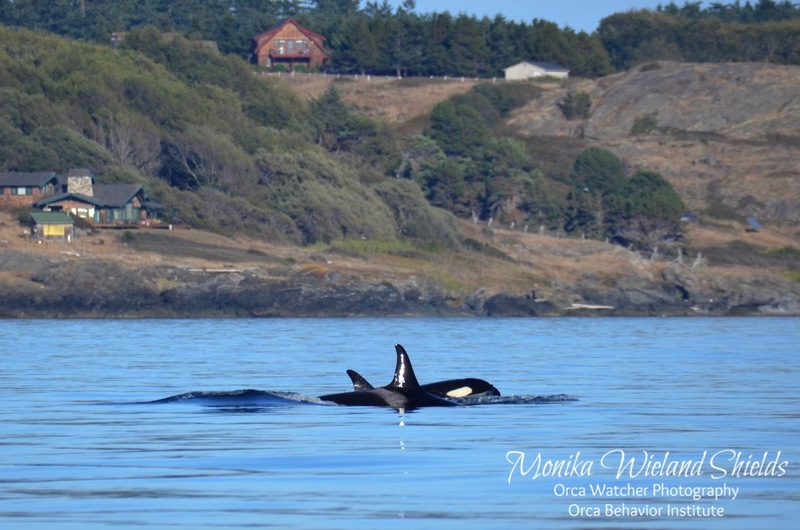 They were definitely in the region "on time" for the late summer, but not seen as much for some reason right around San Juan Island until later than usual. Also unusual is the feeding technique I saw from them - more like skimmers than gulls! The bizarre lighting, by the way, was courtesy of all the regional wildfires. 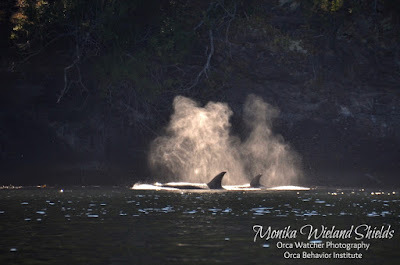 We had a respite from the smoke for a few weeks, but it came back again for a few days before the wind shifted. About 20 minutes after the Js and L12s passed by came the rest of the whales, all mixed up! With the recent news of the loss of K13 Skagit, it was especially bittersweet to see K25 Scoter, her oldest son. He was a real mama's boy, so I'm worried about how he'll do without his mother, but it was good to see him going strong for now at least. Sadly, but somewhat predictably, all three pods left after that, but thankfully we didn't have another month to wait before some of them returned. On September 10th we were surprised when the L4s (on their own) showed up in Haro Strait and spent the day doing the westside shuffle. I caught up with them off American Camp. 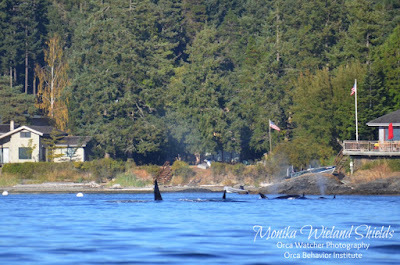 The next day, September 11th, most of the rest of L-Pod came in to join them, but interestingly they were in three groups. Two of the groups went north to the Fraser, while the others (the L12s) spent the day off the south end of the island. 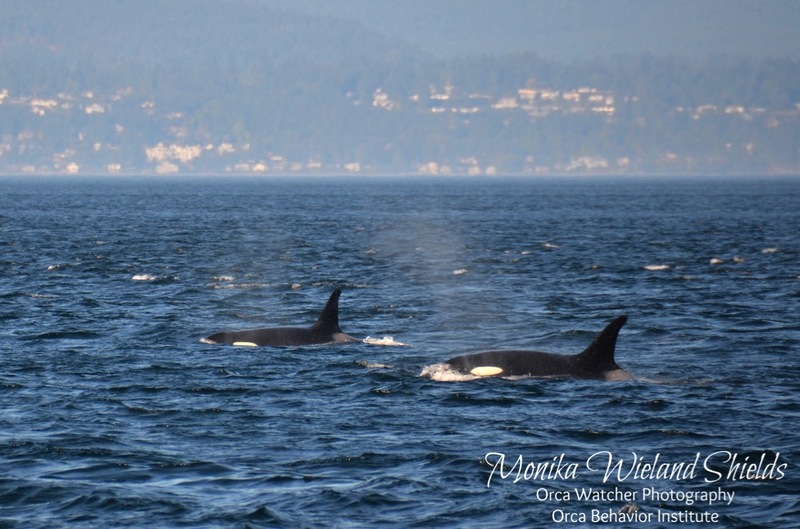 I only got distant looks at the L12s on the 11th and 12th, but then on September 13th the sub-group of L-Pod made up of 19 whales I call the Greater L4s came back down from the Fraser via San Juan Channel. Two things that seem to make the Southern Residents excited are waking up from a nap and meeting up with other whales. Both of them happened at once as the Ls were exiting Cattle Pass. 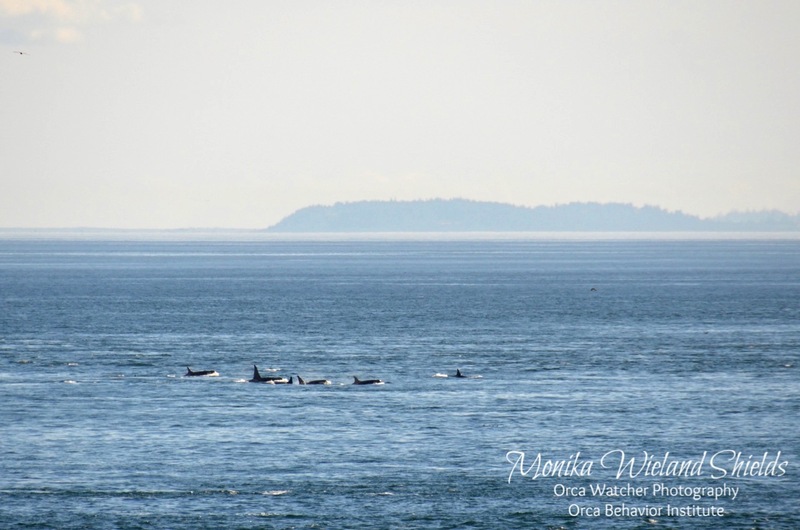 They were a bit far away, but it was amazing to see all the breaches, cartwheels, and tail slaps from a distance as they made a bee-line for the L12s as they left San Juan Channel. 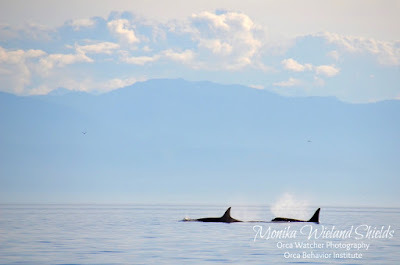 With just a matter of weeks left in what is usually the peak whale-watching season and sightings have been so scarce as it is, we decided to jump in the boat and meet up with them again. I'm glad we did, because they all left again that evening. 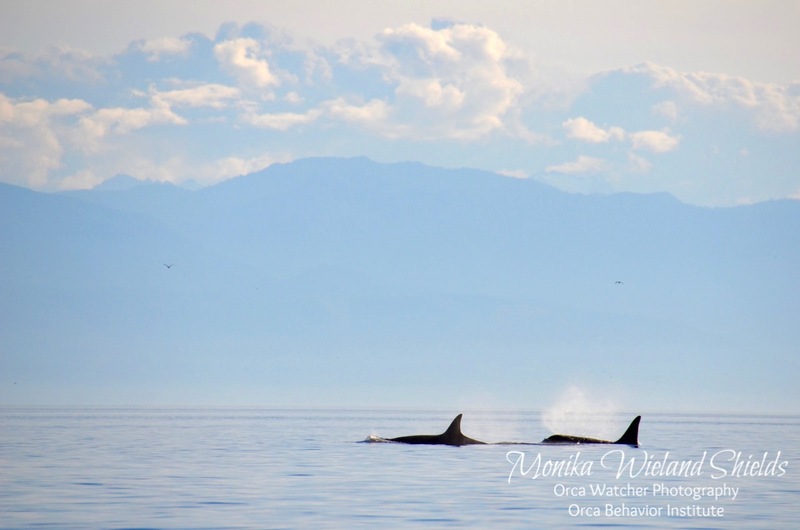 We did catch up with them off of False Bay, where the waters were glassy calm. More whales were visible in the distance in all directions. Before departing, we dropped the hydrophone, and listening to their distinct echoing calls for about 10 minutes as they headed southwest, a direction that would eventually take them back out to the Pacific. It's hard to know when your last encounter with the Southern Residents for the summer season will be, especially this year when they've been absent far more than present. I fully hope and expect they will still return once or twice in the coming weeks, but I have a feeling this will be the last time with them this year where it really feels like summer. It looks like today (the 16th, as I write this will be our last warm, sunny day for a while, perhaps until next year. 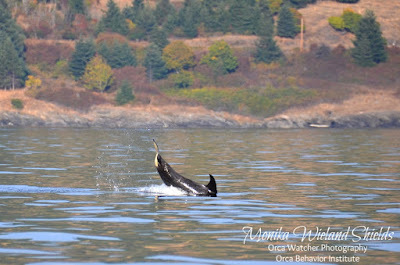 Fall is undeniably here, and I just hope the fall salmon runs come and bring the whales back with them for some late season encounters! 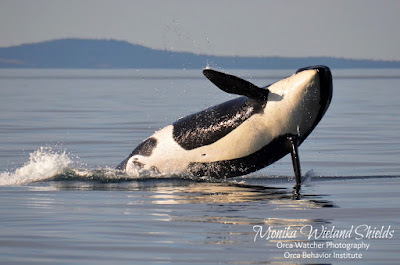 The end of August and beginning of September have been even crazier for transient killer whales in the Salish Sea in a season where sightings have already been off the charts. 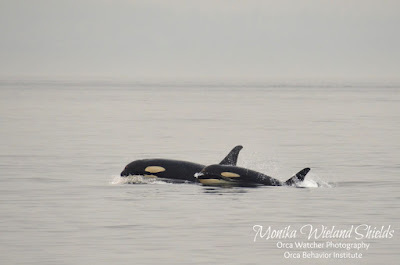 For a couple days we had Ts in as many as a dozen places throughout the Salish Sea, with multiple groups in Puget Sound, the Strait of Juan de Fuca, and the Strait of Georgia. 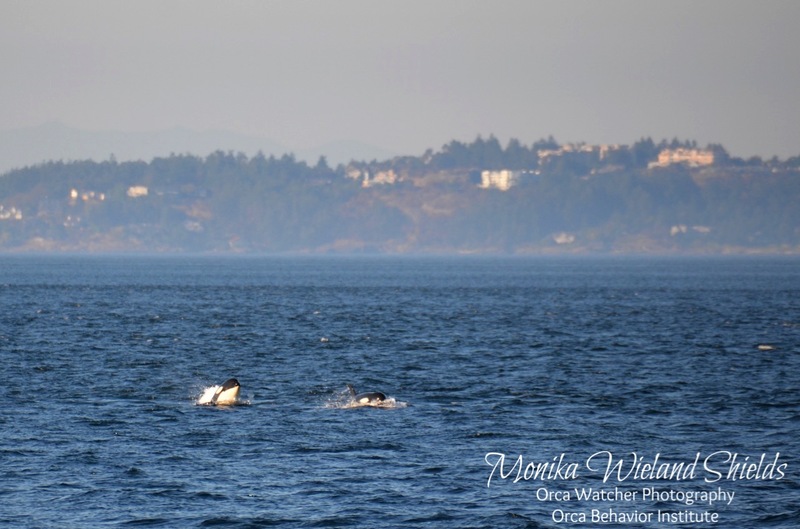 By my rough count there were at least 60 whales in the area! 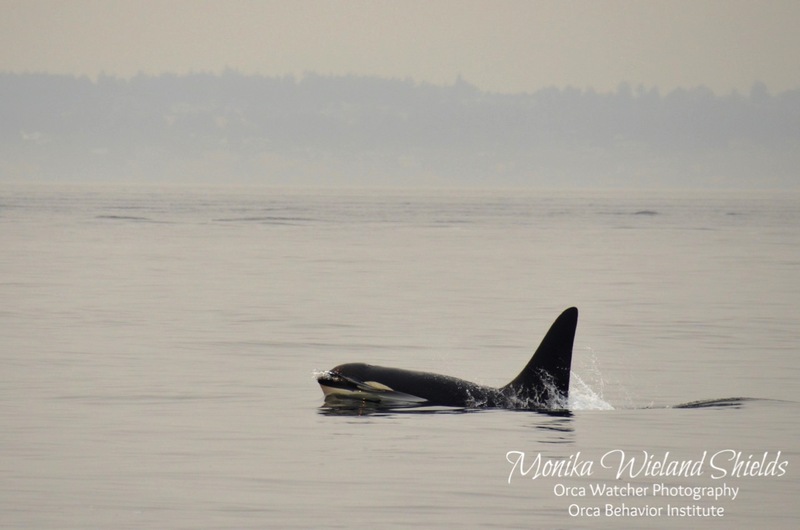 Luckily a few of them did pass through the San Juan Islands and within our range as well. 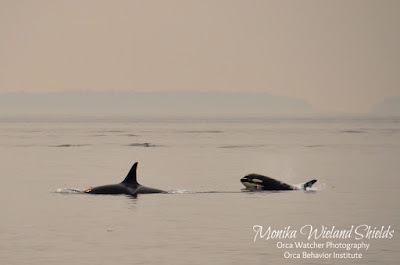 On September 1st, the T60s along with T124A1 and the T124Ds made their way up Haro Strait. 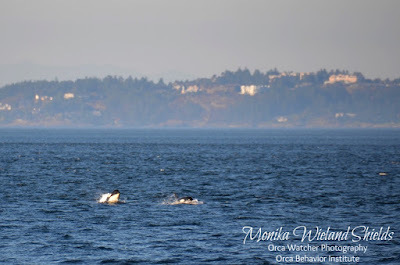 Jason and I just missed them at Lime Kiln but heard they were close to shore, so we quickly hopped in the boat and met up with them just north of County Park. I was super excited when it looked like they might go through Mosquito Pass, the narrow channel between San Juan and Henry Islands. 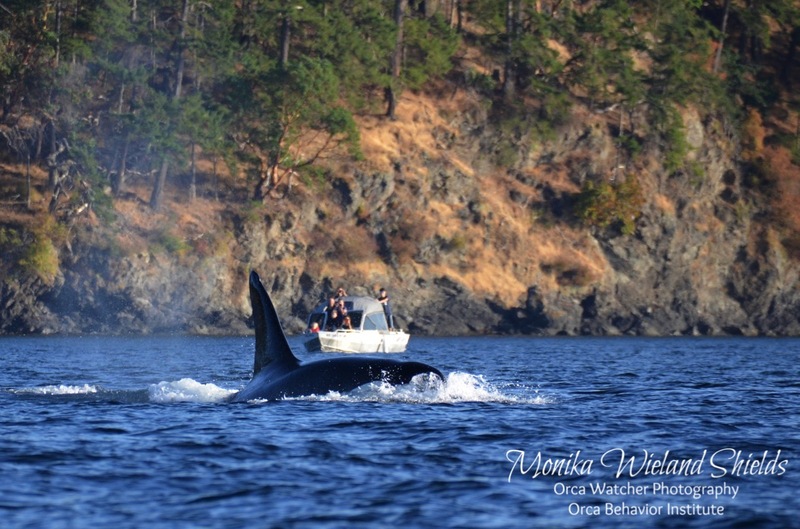 Ts go through there occasionally and it's a place I've dreamed of seeing whales. These guys got partway in, and then seemed to second guess themselves. 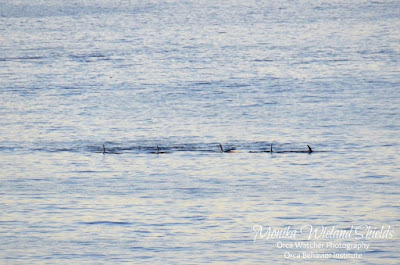 I'm anthropomorphizing here, but it looked like they were just cruising along when they got surprised by how narrow/shallow of a channel they were in, and then they had to have a little powwow to decide how to proceed. Uh...do we really want to go this way? All the boats including us were positioned to the outside of the pass, ready to follow behind them as they made their way through. 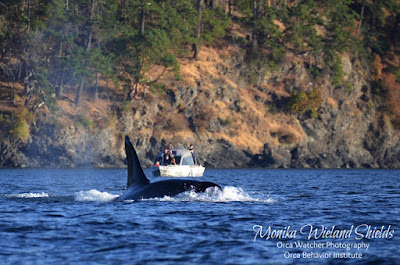 Once they decided to abort continuing on, however, their direction change ended up taking them right through all the boats, giving us and everyone else a memorable head-on look as they aimed for Kellett Bluff. After another detour deep into Open Bay, they followed the Henry Island shoreline for a while. We left them when they made another sharp turn to aim across Haro into Canadian waters. 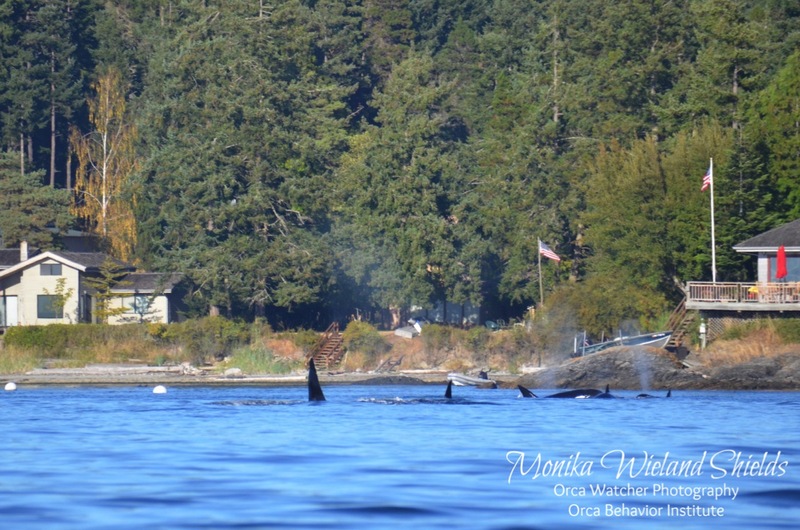 The next day, September 2nd, we got a surprise early afternoon report that another group of transients had appeared out of nowhere off Lime Kiln. 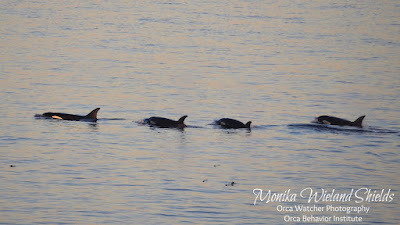 Having again missed them from shore, we again headed to the boat, and again caught up with them not far from Mitchell Bay. It was the T65As and T100s, and at first they were traveling together in one mixed group. Just north of Henry Island, however, they split into their respective matrilines. 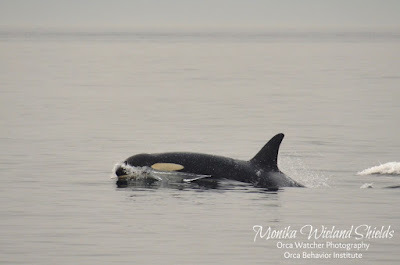 The T65As headed inshore, and we briefly followed the T100s as they continued north up Haro. 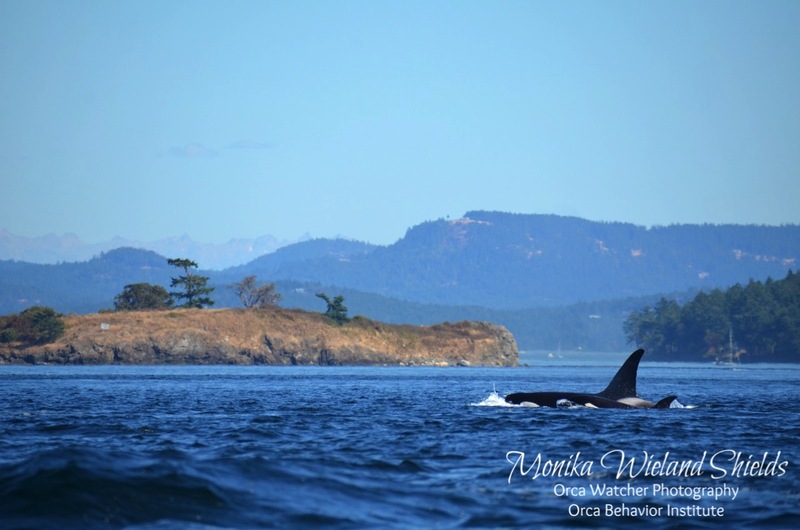 As the T100s continued north, we headed in towards the T65As who were angling towards Spieden Island. At first it looked like they might take Spieden Channel, but instead they cut around the west edge of the island and took New Channel. 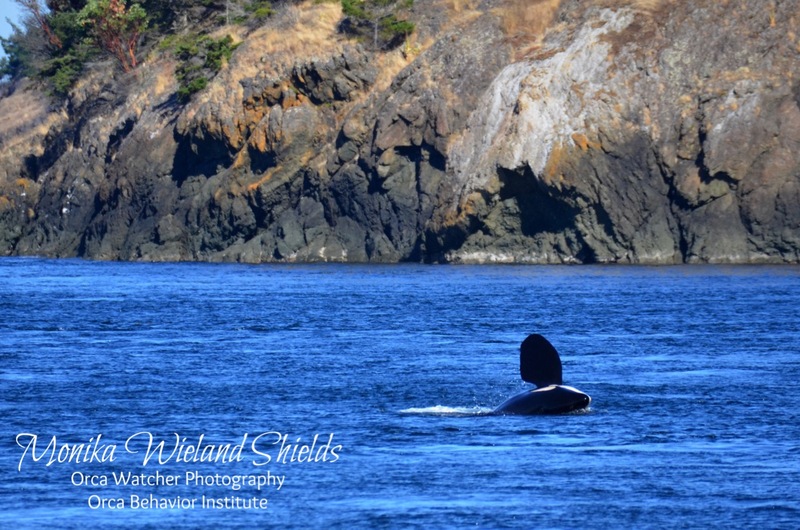 This area, that we call the "back side" of Spieden, is a magical spot to see whales. The island has a steep cliff and is all forested on this side, with no developments. It makes a perfect backdrop for backlit blows, like we saw on this afternoon. 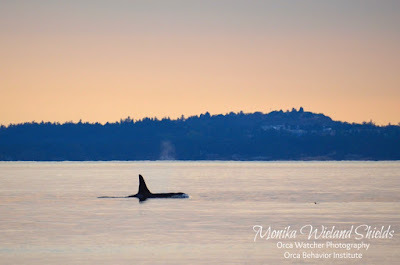 A snapshot of my life: I'm at home and tired from a day of running around when a friend lets me know a group of transient killer whales is on the west side of San Juan Island heading south and hugging the shoreline. 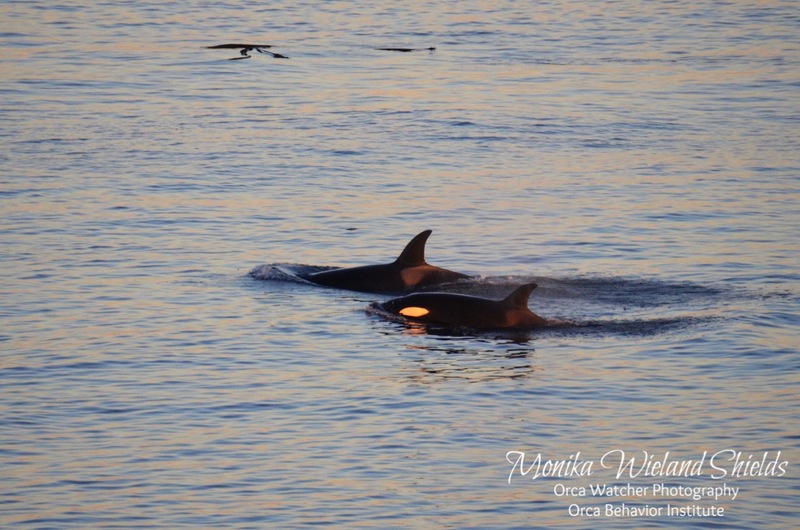 I'm at the wrong end of the island to try and see them, but to get those magic moments, you learn early on: if you can go, go. 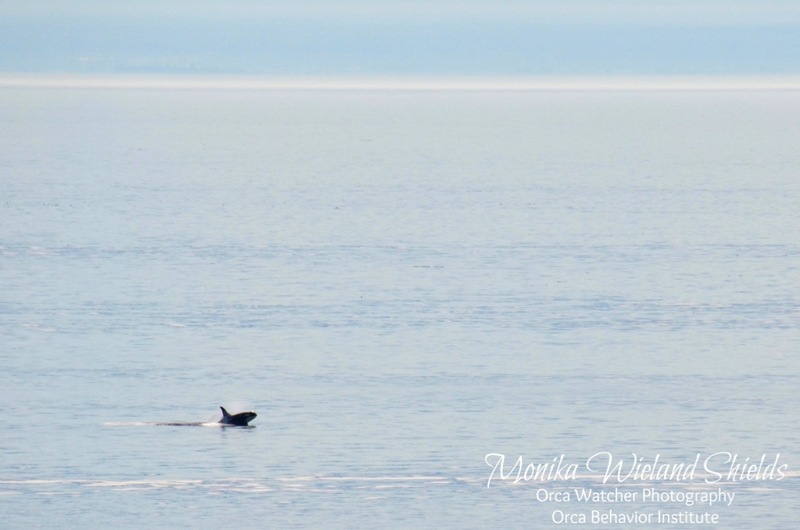 When I get to my first stop at the south end some visitors let me know they've just seen whales pass by, which means I've missed them. I speed walk back to my car and try another spot further down the coast. 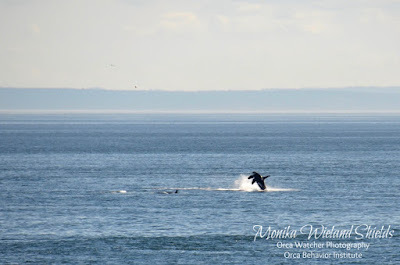 I see the blows and a couple whale watch boats offshore. They're way further out than before but at least I see them. I settle down on a rock content to take in the sunset and collect what data I can from a distance. The other people beside me head back to their car, the final whale watch boat takes off to their home port, and the whales disappear for a moment offshore as the sun sinks towards the horizon. It sounds like a tranquil scene, and it was, for a moment. 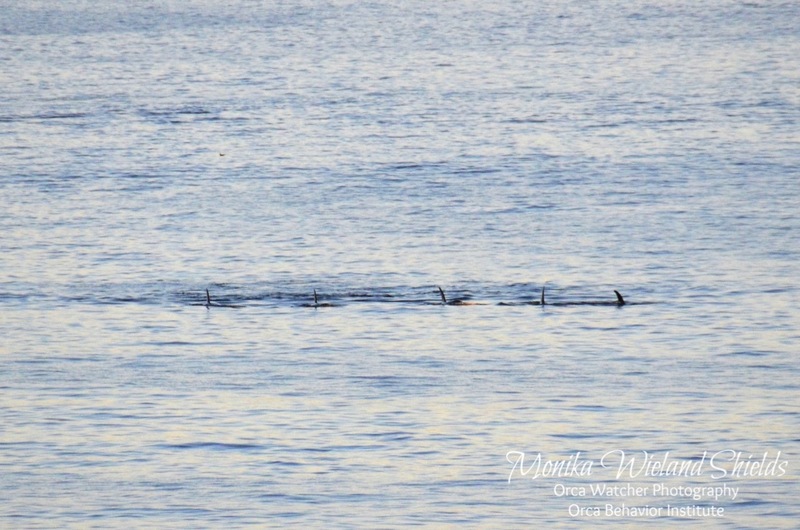 Then I spot the whales again, and now they're all in a line aiming right at me. 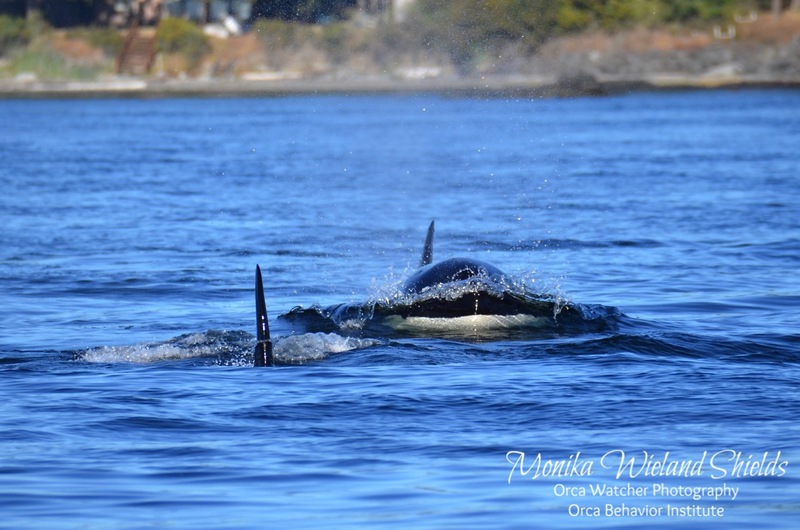 Even from a distance and even after all these years seeing seven dorsal fins all lined up at the surface takes my breath away. 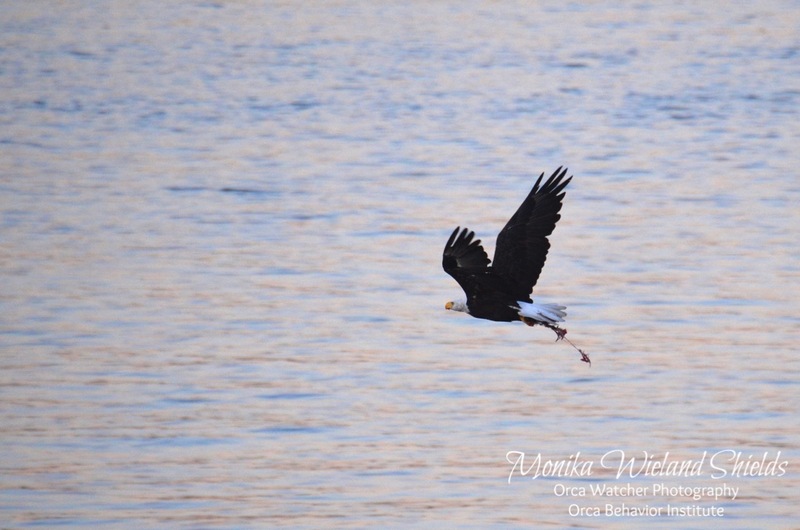 They continue coming closer to shore, directly where I'm sitting, when they go on their long dive. Which way are they going to go now, up or down the beach? I had taken my shoes off but I put them back on. There's only one thing that can get me to run and I have a feeling I'm about to. 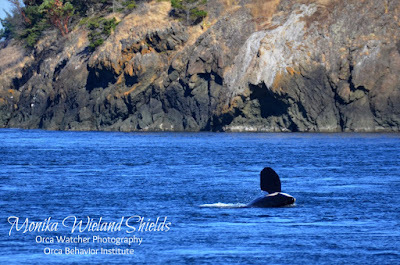 Indeed, the whales surface to my left, aiming right for the Cattle Point Lighthouse and right off the kelp beds off the beach. Let's just say I'm glad no one was their to witness my scrambling after them, though I assure you it was graceful, as I tried to take photos, run, and not lose lens cap, pen, data sheet, keys, cell phone, or sweatshirt, not aided at all by the ridiculously shallow pockets that are always in women's shorts. 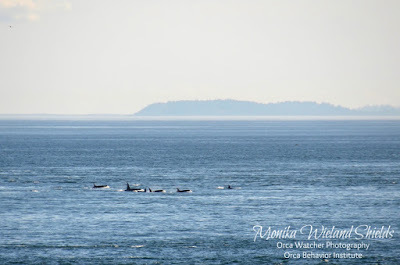 I was a little bit behind them, but close enough to follow them around the corner as they cut a sharp turn right by the lighthouse and into Cattle Pass. I went as far as I could on the trail, then sat down to watch them continue on their way in the dimming light. Before making the long trek back to my car (did I really run this far?) 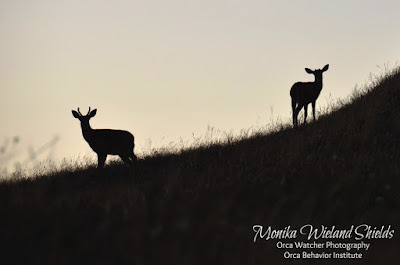 I was surprised by a pair of fox kits, saw three deer silhouetted on the top of the hill behind me, and was passed by a bald eagle carrying the remains of a salmon to a nighttime roost. Oh, then on the way home I had to stop to take a photo of an owl. It's a charmed life, I know, and I'm thankful for it every single day.